Lemon Thyme Roasted Chicken is the perfect recipe for a family dinner. White wine and lots of dried thyme take this chicken recipe to the next level. I’ve talked about this a couple of times before but I’ve realized that Sunday dinners are kind of becoming my thing. A big comforting meal, like this lemon thyme roasted chicken is the perfect way to welcome a new week. I believe that roasted chickens are one of those meals that everyone should have up their sleeve. They are simple, impressive and packed with flavour. For this roast chicken, I focused on two flavours that my mom loves to cook with; lemon and thyme. Plus look at that perfect crisp crust and flavourful gravy? Could you resist? I don’t think so. In general, I just love Sundays. Which I guess is somewhat of an unpopular opinion, but I always feel the most thoughtful and content on Sundays. It’s the calm before the storm. My “recharge” day. And it’s usually a day overflowing with moments, the kinds of moments you want to capture and remember. That first sip of your morning coffee, the chatter over brunch catching up with old friends, not to mention the smell of dinner roasting away in the oven. I like the idea that during the different phases of my life, Sundays will be different. I already know that one day, once I’m finished school, my Monday-Friday will be filled with that 9-5 thing, but Sundays, that’s a whole new world. I can tell you that my Sundays at this moment of being 21 are peppered with brunches and blogging, cooking, baking and cooking some more. There are almost always pages of reading and essays to write. Rainy afternoons spent at the movies or the ballet, or watching Gilmore Girls and back romantic comedies on Netflix. And sometimes, as life goes at 21, all of that is done through that foggy hangover haze. But my favourite part of Sundays? Dinner. Both my parents love cooking, and they often trade off on Sunday dinner duty and sometimes I take over. When I take over, it’s usually for a new recipe I’m testing out (or a few new dishes). Recent Sunday dinner tests have included coleslaw and stuffed peppers but some of my favourite Sundays are outside with dinner cooking away on the grill during the dog days of summer. Those hot July and August afternoons hold some of my very favourite Sunday memories. While this roasted lemon thyme chicken wasn’t one of those summer grilled dishes, it is the ultimate fall and winter staple. I don’t think there are many dishes as comforting as a roast chicken paired with roasted root vegetables and green beans. My recipes usually take a lot of planning and tests, but this lemon thyme roasted chicken is one of those recipes that came together on a whim one afternoon. We had a chicken, loads of lemons and fresh thyme and I couldn’t think of anything better than to combine them all for this delicious recipe. A family favourite, this simple, juicy and flavourful roasted chicken relies on lemon and thyme for flavour. With a crispy skin and delicious gravy, this will be your new go-to roast chicken recipe. 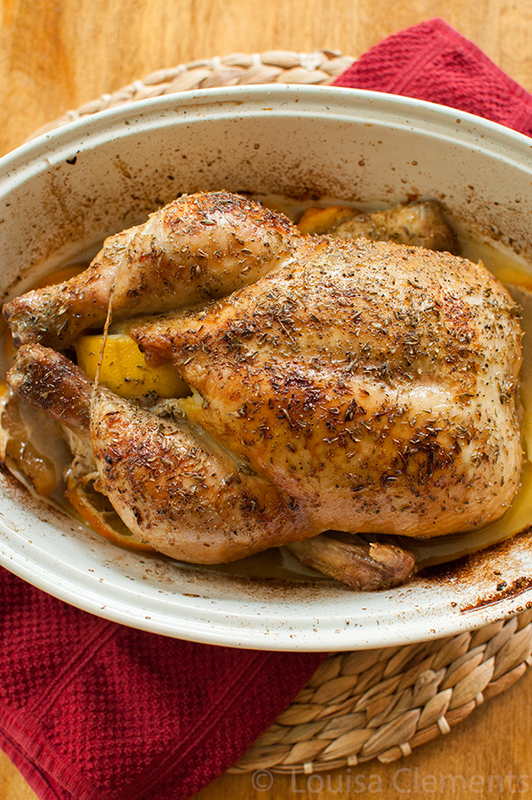 A delicious and juicy roast chicken perfect for Sunday night dinner. Prepare chicken, stuff lemon halves and 2 cloves of garlic in the cavity. Brush with olive oil and sprinkle with dried thyme, salt and pepper. In a roasting pan, arrange lemon slices and remaining 3 cloves of garlic. Add white wine and water. Place chicken on top of lemons. Cover chicken with foil and roast for 30 minutes. Remove foil, baste and cook uncovered for 1 hour or until chicken is fully cooked. This lemon thyme roasted chicken gets it’s beautiful, golden crisp colour from being brushed with olive oil before being sprinkled with thyme, salt and pepper. What is this "brunch" and "ballet" you speak of? :-) You are making me nostalgic for my 20-something Sundays! So much more relaxed and weekend-like than my new Sunday routine. Sigh.I love a Sunday roast chicken...because it's warm comforting Sunday food...but also because it leaves me with enough chicken to make enchiladas/pasta/etc. during the week! Haha! I know Sarah, I'm trying to make the most of them while I can. Great idea to use the leftovers in enchiladas and pasta, I always find myself making a big pot of chicken noodle soup! Wow, does it look so good. It's nice to make a roast chicken when the weather is cool and I find that it smells so nice in the house! Thanks Helene, it really does make the house smell wonderful! This chicken looks like love on a platter - beautiful! I can imagine how wonderful your kitchen smelled while it was roasting. 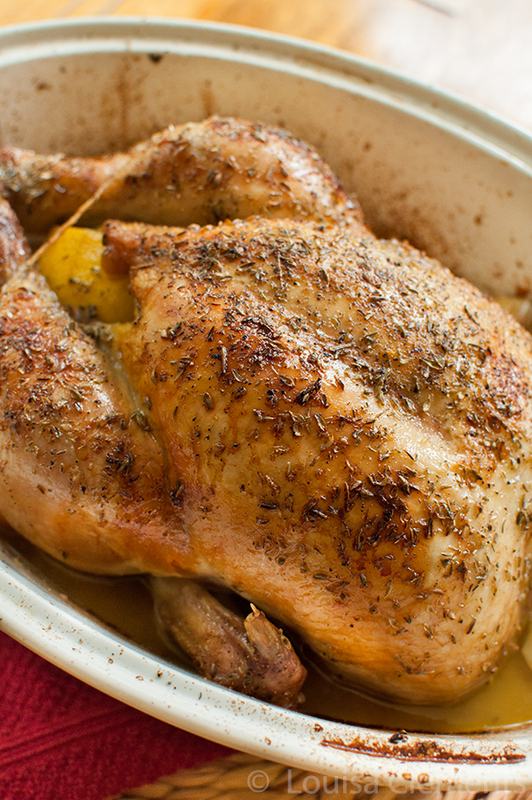 Making your yummy Lemon Thyme Roast Chicken for my dinner tonight! It’s the tastiest & moistest roast chicken EVER!